The congress will take place at Universidade Lusíada de Lisboa installations. The de-industrialization phenomenon of recente decades has created a large number of vacant industrial sites for which is necessary to find a solution other than demolition. Their restoration and re-use are possible and appropriate measures that can avoid such loss and destruction, with advantages for the preservation of historical memory, the urban equilibrium and regeneration of economically depressed areas. As main theme, this 3rd Congress proposes the presentation of pratical examples and methodological reflections in the field of re – use of industrial sites, as well as approaches in other subject areas, such as Heritage, Archaeology, Museology and Industrial Tourism. 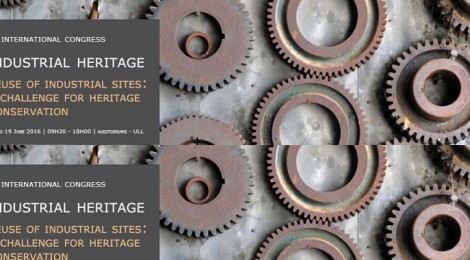 Industrial archaeology and industrial heritage: future directions. Each author may not submit more than two papers. Note: In case of acceptance for presentation, full academic papers are expected by May 3rd 2016. The abstracts and texts (oral or posters) must respect the guidelines addressed to the authors. Papers are subjected to a double-blind pier view process.